The Higher Court has confirmed the Lower Court's verdict that the infamous audio leak between NSS and SIS chiefs doesn't prove that Robert Kocharyan is a victim of abuse of power. Kocharyan has been arguing that the NSS chief gave orders to a judge. In the audio leak, in which NSS and SIS chiefs speak with a cynical laughter about Kocharyan's being charged, it can be heard NSS chief saying he told a "judge" to "give an arrest". Some have interpreted it as a direct order towards the judge, others interpreted it as him legally petitioning for an arrest warrant, then using a braggadocio language during the conversation with his friend on the phone, which he assumed to be private. NSS chief himself has been saying that he misspoke the word "judge" (datavor) and actually meant to say "prosecutor" (datakhaz). The two words have structural similarities in Armenian language. Does NSS Vanetsyan's story add up? Let's look at the details. In the audio, Vanetsyan said "I told datavor Hrach to give me an arrest". HHK-led Parliamentary committee investigated the story, questioned the judge who issued the arrest verdict (which has since been independently repeated by many other judges), and found that this judge's name was not Hrach, and he claims to have never received any orders from NSS Vanetsyan. Now the interesting part. Hrach Musheghyan happens to be the name of the chief prosecutor/investigator who was tasked with getting Kocharyan arrested at the time. This detail backs Vanetsyan's claim that he meant to say prosecutor Hrach instead of judge Hrach. Prosecutor Hrach was also questions by the HHK-led Parliamentary committee. If Vanetsyan misspoke "datavor" for "datakhaz" and told the investigator Hrach to be "courageous and get an arrest", this would not be illegal. Earlier, the Lower Court had examined the tapes and concluded Kocharyan wasn't a victim of abuse of power. This ruling was just confirmed by the Higher Court. The defense plans to take it to Cassations court and later Constitutional Court. NSS has examined the reports of former HHK mayor Taron Margaryan's failure to disclose details of 287mln in employee salary bonuses on 2017, and discovered that no crime was committed in these actions. The story begun when Yerevan mayor Hayko Marutyan transparently disclosed the amount of funds that were spent on salary bonuses towards municipality employees. There was a public debate whether workers should receive a bonus. Roboserj media outlets seized on the public discourse, and tried to accuse Marutyan of purposely hiding the names of recipients, while the delay in name disclosure was in fact caused by municipality consulting lawyers to make sure by disclosing names they wouldn't violate employees' private data laws. Names were eventually published. New mayor Marutyan himself hadn't received any bonuses. Later, the municipality discovered that the former mayor Taron has done similar bonus givaways on 2017, but deliberately hid all the details from the public, and uploaded wrong data on the municipality website. The discovery was sent to NSS for examination. The lack of disclosure by the former mayor Taron was not found to be illegal. NSS has caught the former mayor of Shamlukh with embezzling 14.3mln in state funds. He is accused of hiring non-existent workers, including family, to steal the salaries. One of former regime's "thieves" nicknamed Bogo was recently removed from Central Parking station's property for establishing illegal hotel, office, and illegally collecting funds from drivers. The Parking Center's new director's car was mysteriously arsoned during this corruption fight. Bogo was eventually kicked out by the cops, and had his friends collect his belongings. When the Parking Center's administration decided to check the vacated rooms, they discovered that Bogo's friends destroyed the walls and caused other deliberate damage to the structure. The police has asked Bogo to restore the rooms to the same conditions they were when he first settled in. WHEN ALL ELSE FAILS, SOROS TO THE RESCUE! The media continues the smear campaign against Pashinyan family. The paper Iravunk published a screenshot showing some company receiving $3,000 from George Soros foundation to print 1,000 copies of some book, on the year 2000. The name of the person for contact was listed as "Anna Hakobyan". Paper accused the First lady of taking the money and hiding it from public. First Lady Anna Hakobyan says she hasn't received any $3000 from Soros, and has sent a correction notice to Iravunk, but the latter hasn't corrected the article yet. The book's translator came forward, saying it was actually her, and not the First Lady, who received the money. Her name also happens to be Anna Hakobyan 🍿. It appears Iravunk pointed towards the wrong Anna Hakobyan. Some of the confirmed recipients of Soros money are high ranking HHK officials including the former Parliament speaker, Robert Kocharyan's legal team, Erevan State University administration, various anti-HHK student activists, etc. Or if you can't smear the wife, how about the daughter? Roboserj media outlets recently spread fake news about Pashinyan shutting down a street to organize his daughter's symbolic 20th birthday. No evidence that a street was shut down. It turns out the party was big and 100 people joined, making the expenditures $20 per person. Turns out it's a tradition in the Pashinyan family. A similar birthday party was organized at the younger daughter's 1st birthday on 2008. Yerevan Medical University has won the European HORIZON-2020 grant for its work on brain and neuroscience studies. The organization gave the university 96.6% rating for the research project. The EU organization will fund brain and neuroscience research in Armenia as part of the grant. 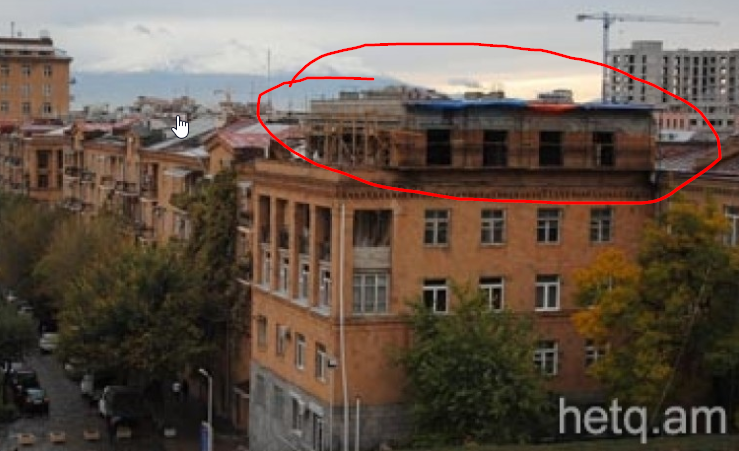 Yerevan municipality will not launch a mass campaign to destroy the extra structures built by residential building residents on the roofs. Instead, the city will regulate and bring them to safety and visual standards, like they did in Paris, says mayor Hayko Marutyan. Transport Ministry has accelerated the construction of North-South highway project by adding more workers and hardware. The project involves a construction of 556km roads to connect the northern point with southerns. It'll cut travel time from 9.5h to 4.5h. It'll also help to connect east with west. Car imports wasn't the only thing that rose double digits on 2018. The exports rose 64%. Export in dollars rose 55%. The average car price was $36,000. The government is working with a travel research agency to use AI to scan tourist comments about Armenia and understand what the weak and strong points are. QP MP Victor Yengibaryan has proposed lowering the speeding ticket from 20k to 10k, then using a multiplier based on the offending vehicle's cost. He says rich drivers don't care about that 20k. He also proposes eliminating cash payments for speeding offenses to reduce corruption. Investigative Service has caught a dishonest military-policeman. He was sent to Artsakh frontline to guard the border, as part of small groups of military-police who routinely guard borders. The cop was shot in the shoulder. He claimed an Azeri solder did it while he was defending the trenches from the Azeri intruder. He was given a medal for bravery. However, A medical examination proved that he shot himself and made up the story. The prosecutors have pressed 5 felony charges for lying to authorities, knowingly putting the blame on someone else, etc. He is told not to leave the country. The Human Rights Ombudsman has visited the Azeri civilian in hospital who crossed the border illegally, during which he was shot in the leg. He was given a translator and had his rights read to him. Elvin Arif Oglu has asked a permission to speak to his family members. The NSS has agreed, and will also invite the man's family to visit Armenia for a personal visit. Azeri authorities say Elvin has mental issues. He will be charged with illegal border crossing. An a similar incident, earlier an Armenian man with mental issues crossed the border before being arrested. The Azeri authorities' response was different, however. The man was charged with made up terrorist claims and sent to jail for 20 years. Parliament speaker Ararat Mirzoyan went to Germany as a continuation of back and forth visits. He spoke about German investments in Armenia, and has asked Germany to teach about the Armenian Genocide in German schools. Swedish Vasteras city will build a monument dedicated to the victims of 1915 Armenian Genocide in Ottoman Turkey. Sasna Tsrer party's Jirays Sefilian says the party will begin an initiative to join Artsakh to Armenia as a new province. This page was last edited on 24 March 2019, at 01:53.